What are the differences between the secular and biblical worldviews? Find out with guest Carl Gallups on the show Christ in Prophecy. Last aired on July 27, 2014. Dr. Reagan: What does it mean to have a biblical worldview, and how does it differ from a secular worldview? Public opinion polls reveal that the average Christian has no idea what the difference is between the two. For a clear explanation from a renowned Christian author, stay tuned. Dr. Reagan: Greetings in the name of Jesus, our Blessed Hope, and welcome to Christ in Prophecy. My colleague Nathan Jones and I have a very special guest with us today. His name is Carl Gallups, the author of the best-selling book called, The Magic Man in the Sky. Nathan Jones: Carl is the long time senior pastor of Hickory Hammock Baptist Church in Milton, Florida. And that’s in the panhandle of Florida near Pensacola. Additionally, he is a conference speaker, evangelist and Christian media specialist. And in that capacity he is one of the founders of the world famous PPSIMMONS YouTube Ministry and Biblical Apologetics channel. He is also a prominent radio talk show host. Dr. Reagan: And as I said before he is the author of the best-selling book right here, “The Magic Man in the Sky.” It is one of the best books that I have read in recent years, and the moment I finished reading it I picked up the phone, called Carl and invited him to appear on this program. Carl, welcome to Christ in Prophecy. Carl Gallups: Thank you Dave. And it is my honor to be here, that you for picking that phone up. Dr. Reagan: Well it’s our honor to have you. Carl I just want to start off with the title, this is a very unusual title. Dr. Reagan: And in fact it was the thing that attracted me to the book, I thought, “What in the world is this all about?” Tell us, what does the title mean, “The Magic Man in the Sky.” Where in the world did that come from? Carl Gallups: Well you’re not the first person to ask me that question. Well it was meant to be thought provoking, provocative even if you will. But the skeptics, atheists, they know exactly what the title means because it is an argument they often use. And a lot of Christians know what the title means in that they have heard it used against them. Dr. Reagan: So atheists just use this flippantly. Carl Gallups: Well they do, yes. Dr. Reagan: In reference to God. Carl Gallups: And it basically goes like this, the argument goes like this, “Why should I believe in some magic man in the sky like you do, when I can believe in settled scientific fact?” Or, “I would rather believe in settled scientific fact than some magic man in the sky.” Well I spent a lot of time in ministry as you mentioned internet ministry and I’ve spent years of debating skeptics, and atheists, and agnostics. And this argument kept coming up, and coming up. Finally I said, “You know I need to address that somehow in a world reaching venue.” And so the Lord puts this inspiration of this book idea on my heart and my book deals with a whole lot more than just this argument. Dr. Reagan: You don’t like that title do you? Carl Gallups: I don’t like the title. Dr. Reagan: Well tell us why? 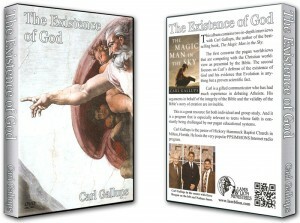 Carl Gallups: Well because, because the word magic man in the sky, the whole argument is a misnomer. It is a biblical misunderstanding. Neither the Bible nor the Christian declares that God is magic or that He uses magic. Carl Gallups: Neither the Bible nor the Christian who knows the Bible in context would declare that God is merely a man. Now we know that God put on flesh through His Son Jesus Christ presented Himself as a man. Carl Gallups: God with us, we understand that concept. But God is not just a big man, a bigger form of a man floating around out there in space somewhere. Carl Gallups: Yeah, performing magic and certainly He doesn’t live in the sky. So what it does it conjures up when a skeptic uses it, or an atheist uses it, or an agnostic, they are conjuring up this image, this is the straw man argument. They are conjuring up this image of some grandfatherly looking fellow in a rocking chair with a magic wand floating around in the clouds. Well once you develop that caricature in someone’s mind especially a Christian who is not expecting that attack, it can debilitate a Christian. Listen to the two straw men, “I’d rather believe in settled scientific fact,” well that’s an oxymoron, I don’t know if there is anything settled in science, “you know than a magic man in the sky.” Which is another complete misnomer. So no I don’t like the title. I like the title of the book and God has used it, but the argument of it is completely unbiblical. Dr. Reagan: Well before we get into the substance of the book Nathan you wanted to. Nathan Jones: Yeah I wanted to greet you to the show. Our show seems to attract former policemen gone into the ministry. And I hear you were a policeman that made me interested. Tell me a little about your background, how you got into ministry from police. And especially internet ministry interests me and I’d like to hear a little about that. Carl Gallups: Ok, well I appreciate it. I started young I was Florida’s first 18 year old correctional officer and that was with the Florida Department of Corrections, the state prison system. Two years later at the age of 20 I was Jefferson County Florida’s first 20 year old Deputy Sheriff. Now this was back in the days when everything used to be measured as an adult from 21 and over years ago. But they had just changed the law about the time I turned 18. Nathan Jones: You could arrest people, but you couldn’t drink. Carl Gallups: Well that’s right. You could go to war, but you couldn’t, yeah. So but they had changed the law and I was just turning 18 at the time and was very much fascinated by the law enforcement field and career. So anyway I applied, it’s a long story, but I became Florida’s first 18 year old correctional officer then Jefferson’s County first 20 year old deputy sheriff sworn, patrol officer. Carl Gallups: And then I worked for them for several years, and I worked for Leon County which is the capital of Florida and worked for them. So I spent 10 years in law enforcement, six or seven years as a sworn officer as a criminal patrol officer, and then a few years doing some of my own criminal investigations. Nathan Jones: But your heart was in ministry all that time? Carl Gallups: Well not all that time in ministry. Now I was a Christian. I was saved at the age of 16 so I was a Christian during that time, and I was married. But in my late 20’s God really began to impress upon my heart a call to full-time ministry. Now I got to tell you, I’m a little bit ashamed of this part of my testimony. Do you know that it is entirely possible to be in love with the Lord, be doing the work of the Lord, I mean I was in church, I was teaching Sunday school and still be running from the Lord? I think of a man named Jonah, in other words I was happy in law enforcement. I was doing well I was advancing in my career. My college education was in criminal justice. I graduated from Florida State in Criminology. Everything was geared towards that, and God messed up my life, tongue-in-cheek, by interfering with my happiness and calling me into full-time ministry. The bottom line is I ran from that calling for a couple of years. I’m ashamed of that now because God has so blessed my ministry and my life. But so I finally surrendered fully to God’s calling on my life and then began my journey with the Lord in full-time ministry. But I went through all of that because people always ask me, “How did you go from being a cop to a preacher?” And the story is kind of complex. I didn’t just get up one day and say, “You know what I’m tired of being a cop, I think I want to be a preacher.” No, no, no, I loved being in law enforcement. I did not want to be a preacher. Nathan Jones: We’ve had Don McGee and Jeff Seif on this show and each time they were also policemen who went into ministry. Carl Gallups: So they have similar testimony? Nathan Jones: Similar yes, ran from the Lord but they took ministry. But so now you do all internet on top of the pastoring? And radio too? Dr. Reagan: And these programs deal with current issues right? Dr. Reagan: From a biblical viewpoint. Dr. Reagan: So are any of those programs available on the internet? Carl Gallups: Yes they are. They can all be accessed, the easiest way is to go to carlgallups.com and on the top right hand corner it says listen live, click there all the information about me and my ministry and radio programs everything at carlgallups.com. Dr. Reagan: Welcome back to Christ in Prophecy and our discussion with Carl Gallups the author of a fascinating book called, The Magic Man in the Sky. Carl, you began your book by contrasting the secular worldview with the biblical worldview. Tell us how would define the secular worldview? Carl Gallups: Well, thank you Dave that is a great question. You know worldviews are extremely important, worldview is just the way that you filter information of life. We make all of our decisions about life on our worldviews; who we are going to marry, what kind of job we are going to have, how we are going to live, etcetera. So the secular worldview is totally man centered there is no room for God, Intelligent Designer. There is no room for creation. Dr. Reagan: It is all about me. Carl Gallups: Yeah, it is about man. The secular worldview focuses on man, so that’s the worldview of the atheist for example. It is the worldview of the agnostic, and most agnostics actually live as atheists, they call themselves agnostics. And the worldview of the one who holds to evolution proposition as the answer to life. Dr. Reagan: I would say it is the worldview of the majority of people in the United States today. Carl Gallups: Whether they know it or not. Carl Gallups: Because some people would disagree with you, and say, “I don’t have that kind of worldview.” But they live as they really do have a secular worldview. I would agree with you. Dr. Reagan: Go ahead, Nathan. Nathan Jones: Oh, since he was telling us the secular worldview and you talked about a religious worldview, then you talked about a biblical worldview. Most people think they have a biblical worldview, but they really have a secularist’s worldview. Maybe you could help people see if they have the biblical worldview by telling us what one is. Carl Gallups: I’ve never had anybody come to me and say, “You know what he was lost preacher.” You know. Nathan Jones: That is funny and sad at the same time. Carl Gallups: Well it is, it is and that’s the illustration that I use to show the difference of people who say they have a biblical worldview, but then when life really you know comes down to the bottom line they think a secular worldview. And of course that secular worldview that I just described, you know is the heresy of universalism, all dogs eventually go to Heaven, regardless. Amen, Jesus is the way, Jesus is the way. But now for my friend, just because he was a good person, so. Nathan Jones: And that is the religious worldview the third view in your book? Carl Gallups: Well the third view I try to make the distinction between a distinctly contextual, biblical worldview as just opposed to all of this other religiosity in the world, because there are many religious views of life. Nathan Jones: Man’s search for God. Carl Gallups: Yeah, yeah. Well Satan is a religious being; I mean let’s just deal with it, so he is the inventor of religions. Carl Gallups: But yet there is a relationship with our Creator, a relationship that comes through a born again experience in our relationship with Jesus Christ. But everything else because for example there are people who would say, “I’m not a secularist. I believe there is God or gods. I believe there is a Creator, I believe there is an intelligence.” And then they get off into all this esoterical spiritual stuff. That’s the religious worldview, and billions of people live by a religious worldview. Dr. Reagan: What’s so disturbing to me is that we have organizations in America today that specialize in taking religious polls. And these polls are showing that people who claim to be evangelicals will answer 51% or 52% saying there are different roads to God. Dr. Reagan: Jesus sinned, and things like that. It’s like they know nothing about the Bible and they do not have a biblical worldview. Carl Gallups: That’s right. No, you nailed it Dave. Dr. Reagan: What’s the problem here? Carl Gallups: Well the biggest problem is just our sin nature and a refusal to deal with the truth, the true revelation of God’s Word. Some of the problem comes from pulpits and the watered down preaching of the Word. Dr. Reagan: I was going to say there’s a famine of the Word today. Dr. Reagan: And people are not being taught the Word, they are not taught the fundamentals of the faith. Carl Gallups: Right, and then some of the problem comes from dynamic contextual biblical preaching from the pulpit, but people sitting in the pew who are just not processing it then and don’t want to deal with it. And they’ll pick and choose what they want to believe and hear. It’s human nature. It’s just something that we deal with. Dr. Reagan: There is a fella who takes a poll of entering freshmen every year at Wheaton College which is one of the foremost evangelical colleges in America. And all of these people coming there are coming from families where they have grown up in church. Dr. Reagan: And every year this poll has shown less and less knowledge of the Bible. And they’re not difficult questions, it is like name one of the four Gospels. Name two of the Apostles. You know and they can’t do it. And you wonder what are they doing in youth programs? Weenie roasts? Hayrides? Watching movies, eating pizza? Carl Gallups: Yes, yes, yes and yes. Nathan Jones: Not at his church. Carl Gallups: No, no, no. Well I’ve just dealt with this recently and I don’t want to be too detailed here, but just been very disappointed recently in dealing with a group of people putting together this big out reach of youth ministry and listening to them talk about their Bible studies they are going to have with the youth. And we’ve had to stop and correct them and say, “That’s not a Bible study. That’s not a study of God’s Word.” But people as you just nailed it so perfectly a minute ago, they have gotten off base, off track. The Word of God there is a famine for truth and knowledge and so, yes you are right there are people who say, “Oh, I come from a biblical worldview.” Ok, what does that mean? And then they can’t tell you. And or they live as though they believe a secular worldview. Nathan Jones: Welcome back to Christ in Prophecy and our discussion with Carl Gallups the author of a very insightful book called, The Magic Man in the Sky. And Carl I had a question for you: something in your book that was so deep and it talked about two realities, a physical and spiritual reality existing side-by-side but one not seeing the other. And atheist always say, “Well there can’t be a spiritual realm because we would know it, we’d see it.” But how do you refute that. Carl Gallups: Yeah, thank you. Well no that is a very, Nathan, thank you that is a very important concept and principle for folks to grasp. Simply because you can’t see something, feel something, measure something or subjectively measure it does not necessarily mean that it doesn’t exist. Now it does mean that we should examine it to the depth of any reasonable means possible. But, so the atheists would often make the argument like you just said, “Well because we can’t see it, touch it, measure it, feel it, you can’t talk to God stand on a hill, “Strike me dead if you’re there,” yet nothing happens, so therefore God doesn’t exist. And the illustration that I use in my book, one of the illustrations is what I call the fish pond story. Carl Gallups: Under the surface of a fish pond that is located in the middle of a 5,000 acre ranch, say right in the middle. Say the fish pond is 10 acres. Under the surface of that is an entire universe of reality. Everything that lives under the surface of that pond that is their reality, they are bound to that watery existence. Beyond the surface of that pond is what you and I know is a universe of reality, not only the world that we live in but the solar system, and the universe beyond. So the fish living in that pond have no concept, they have not a clue of the magnificence of what lies beyond just the surface of that water. And they have no concept of your life and the intricacies of your life, human life, much less the other seven billion people that live on the planet. They’ve never seen a city or a skyscraper or an airplane, or a train. Dr. Reagan: They might see a shadow once in a while. Carl Gallups: Well and I was getting to that point. Carl Gallups: That every now and then they might see a shadowy existence of something that comes to the edge of the pond. Of course the Scripture talks about how we see through a glass dimly. Carl Gallups: Yes, yes, yes. So we get glimpses of glory if you will. God gives us glimpses of glory. But until we come out of our fish pond enter into the realm of what’s really real, see, we don’t have a clue what it’s like to truly be in the presence of God. Anymore then a fish has a clue what. See if a fish could somehow become a man and step outside the pond and look around and say, “Oh my gosh I had no idea.” And but here’s the answer, it existed all along, all around you, in physical reality, flesh and blood reality. See a fish is flesh and blood. Now it’s a different kind of flesh, but its flesh and blood, it’s physical. We’re physical we’re flesh and blood. But two physical realities exist side-by-side, one is totally unaware of the other. In fact not only are they unaware but they cannot enter into our reality and exist in it. And I believe that’s an illustration of the deep spiritual truth that Jesus was trying to reveal to us. Look when you pass from this existence you’re not just some little fluff of spirit floating on a cloud playing a harp forever. You enter into a physical reality, I am going to use the word physical, but it is glorified like when Jesus came out of the tomb, He was physical, but He was glorified. When you enter into reality, in fact it is the ultimate reality, the presence of God we are just in a fish pond. We’re surrounded by our limitations. We are surrounded by the surface. We are in a watery existence and we don’t even know it. But when we leave this existence we are like a fish that becomes a man and we look and there is this endless array and vastness of the universe that God says, “This is mine. Now it’s yours because of your faith in my Son Jesus Christ.” And we enter from one reality to another reality. If you will one dimension of reality to another dimension of reality. In the same way the fish pond exists in that dimension and its real, and all around it is another dimension and it’s real, but it is the ultimate reality. Dr. Reagan: I love your fish pond story. Carl Gallups: Thank you, I appreciate it. Dr. Reagan: The moment I read it I thought, “Well you know equivalent to that is the fact that we as Christians know that there is a reality around us that cannot normally be perceived with the senses, it’s the reality of the supernatural. Dr. Reagan: Of demons, of angels, of God intervening in history. Dr. Reagan: And you can’t normally perceive that, but in the Bible we are told from time to time even angels can take on a bodily form and you may entertain angels unaware. But then I got to thinking further and I thought, “Can I think of a situation where human beings have lived together with another reality and not know it?” And it suddenly occurred to me the germ theory of disease was not even discovered until the mid-1800’s. Dr. Reagan: There was a whole micro-biological world that has always existed around us, and in us that we know nothing about. Carl Gallups: Perfect example, yeah. The whole field of quantum science, quantum mechanics. Nathan Jones: Atoms, and yeah. Carl Gallups: Oh, yeah that is fascinating. Dr. Reagan: Now you’re getting into the Twilight Zone. Carl Gallups: Yeah, I have a little bit about that in my book too because it so illustrates, you just nailed it. There are realities that exist all around us that we can’t see, you know. No one has ever seen a quantum particle with their eye. We see the effects, we can measure it through various electronic means. But it’s there, we know it’s there for example. But another example back to the fish pond story, a man can put on a scuba suit and enter into their world. And a fish can say, “You know, ok, now I know what a man is.” But really they don’t, they really don’t. They’ve seen a man in a way that could exist in their realm but they really still know nothing about humanity. And in the same way God put on flesh, God with us in the person of Jesus Christ we saw God in the flesh, but we still have no concept of the total reality of who God is. And the Word of God says but when we’re with Him we will know Him as He is, when we see Him face to face. Does that make sense? Carl Gallups: In other words God put on the scuba diving suit, came into our world so we could get a feel for Him. But His ultimate glory we have yet to see, until we are out of the fish pond and with Him. Dr. Reagan: Well on page 207 of your book you even talk about that science has to admit that it has proved that there are realities that can exist side-by-side and be unaware of each other. Dr. Reagan: Even science has to admit it. Carl Gallups: Even science has to admit that, yeah. And I was thinking specifically again of the microbial world and then the world of quantum mechanics, and quantum theory. You know we benefit from our understanding of quantum mechanics everything from lasers to MRI technology to nuclear technology, but there is so much about it we don’t know, and so much about it we can’t see and haven’t seen and still theorize about. But even science has to admit that there is a world of reality that is beyond our comprehension of explanation and beyond our ability to see yet it exists and we know it exists. Dr. Reagan: Have you had a personal opportunity to share some of these arguments with atheists of agnostics and see how they respond? Carl Gallups: For years before I wrote the book, that is why I finally wrote the book. Dr. Reagan: How do they normally respond? Carl Gallups: Yeah, well you know when they’re honest and when we have decent conversations its pretty mind blowing to them. In fact we have led many to the Lord, to a saving relationship with the Lord. And that is one of the exciting things about internet technology and internet ministry now is that you can reach out to the world. And you can ministry to people in a way that’s a little less intimidating, a little less threatening because you can do it by e-mail, you can do it in blogs, and those kinds of things. And every week people come out of atheism, they come out of this evolutionistic philosophy of life and come to Jesus Christ. Dr. Reagan: In fact you have some testimonies don’t you about the impact of the book upon Atheists and Agnostics and people just totally confused and don’t know what they believe? Carl Gallups: Yes, yes they are really beginning to pour in this antidotal understandings of how God is using the book and I’m overwhelmed. I just give Him all the praise in full. Dr. Reagan: Well the book is written in such a way that it is easy to understand. Carl Gallups: Well thank you. Dr. Reagan: Wouldn’t you say so Nathan, it just flows and it’s easy to understand? Nathan Jones: Yeah it flowed very well. Dr. Reagan: You don’t have to be a physicist or a scientist or whatever. And the arguments are so logical that’s the point, that you can’t think of a way to refute them. Nathan Jones: And you start with a story too in the beginning of a Christian and a non-Christian and how the non-Christian blows the Christian out of the water. To me that connected me to the book right there because I recognized all those arguments. And then you answer all those arguments so it is like a self-help tool for any Christian who wants to share their faith. Carl Gallups: Thank you, I appreciate it. You know I wrote the book and the first chapter I didn’t have in it between Christopher and Crowley, I didn’t have that in there. Dr. Reagan: This conversation there. Carl Gallups: No, so everything after that I had and then it just was from God, it was just this inspiration. Why don’t I start the book with a fictitious conversation between a Christian and an atheist and let the atheist dump all of his arguments and destroy the Christian. So the first chapter that’s what happens. Dr. Reagan: I thought, man I don’t like this, I have to keep going. Carl Gallups: Well and it’s meant to draw you in because if you’re a Christian you’re thinking, “How does the author get out of this?” And if you’re an atheist your thinking, “I like this book.” You know and then their thinking, “I wonder what kind of argument, I mean he’s made all of my arguments. I wonder how he deals with this.” So it served its purpose and God has blessed it. I think it was an inspiration, I think it was inspired by God to put that first chapter there. Dr. Reagan: Now you’re writing a book right now aren’t you? Dr. Reagan: And what is it titled? Carl Gallups: I am not allowed to give the title out yet. Carl Gallups: But I can tell you that it is a juxtaposition of; the theme of it is biblical truths versus political agendas and cultural myths. Carl Gallups: In other words you just take topics of the world today, you know homosexual marriage, abortion. Evolution is it settled science? Gun control, I mean all of these things that impact our lives and decisions we make. And legislatures are making laws, world government are dealing with all of these things. And I take every one of those and I compare it to God’s Word. What does God’s Word really say? What would Jesus say? What would Jesus do? What’s the truth? Is there an agenda here? How do these things tie together? What’s the spiritual agenda? So I tie all of this together and it’s going to be my next book. Carl Gallups: By the way Christopher and Crowley are going to show back up in this book. Nathan Jones: Are they? Oh, good. Carl Gallups: Yeah, they are going to show up again. Dr. Reagan: You know the issue of truth, you know the world today says there is no such thing as absolute truth which in itself is an absolute statement. Carl Gallups: It is, are you absolutely certain? Yeah, well that’s a classic argument when somebody says to me, “I don’t believe in absolute truth.” I say, “Really are you absolutely certain?” And then you got them. Dr. Reagan: But there is a real rejection of that today. Carl Gallups: Well there has to be if you’re going to come from a secular worldview. Dr. Reagan: Yes, every things relative you know. You have your truth. I have my truth. Carl Gallups: That’s right, that’s right. There is no eternal consequences. There’s no accountability. Dr. Reagan: And we must be tolerant toward each other. Carl Gallups: Oh, yes except they can’t be tolerant of us with a biblical faith. Dr. Reagan: Other than a Christian worldview.